Mobile, big data, social and cloud technologies are changing the enterprise as we know it. 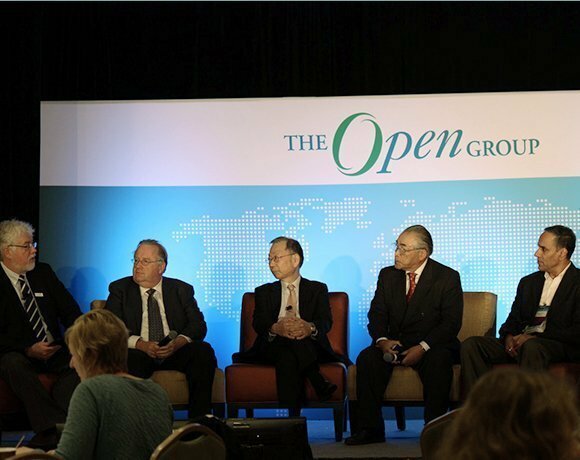 At the Open Group Open Platform 3.0 Forum in San Francisco, experts discussed how organizations can take advantage of such advancements and weighed in on enterprise architecture and applications dependability. Weren't able to make it to the Forum? Check out these tips and action items on how to maximize various new emerging technology trends including social, mobile and cloud gleaned from sessions led by Microsoft's Enterprise Architecture Lead Alan Hakimi and veteran computer researchers Junkyo Fujiedaand Mario Tokoro. Panelists from left, David Lounsbury of The Open Group, Bill Brierley of Conexiam, Dr. Mario Tokoro of Sony Computer Science Laboratories Inc., Junkyo Fujieda of ReGIS, and TJ Verdi of Boeing weigh in on enterprise architecture and applications dependability at The Open Group Open Platform 3.0 Forum in San Francisco, Calif.